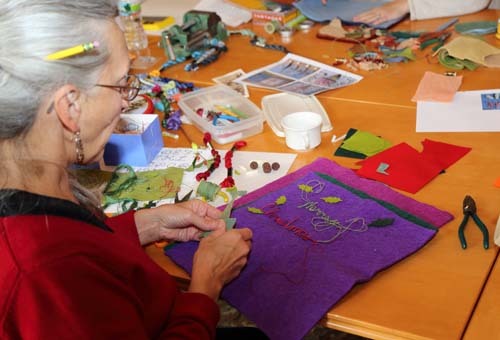 Last Saturday, a group of lovely women gathered at Highfield Hall in Falmouth for my felt banner workshop. Lynn and Christy treated the workshop as a destination event. They drove down from Vermont a day ahead and spent the afternoon riding their bicycles on our prized Shining Sea bike path. The next morning, they were eager and ready to go before we officially started at 9:30. I brought wool felt and other supplies like thread, wire and an alphabet guide. 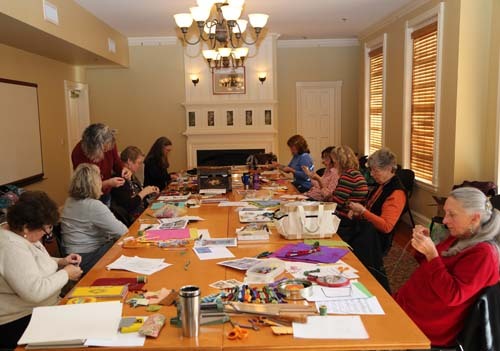 The class was made up of stitchers and quilters who felt very comfortable with a needle and thread. Everyone came with an idea of what kind of banner they wanted to make, so they got right to work. There were holiday signs, a baby banner, a Chinese proverb, a sewing room sign, and one woman made personalized tooth pillows for her nieces. 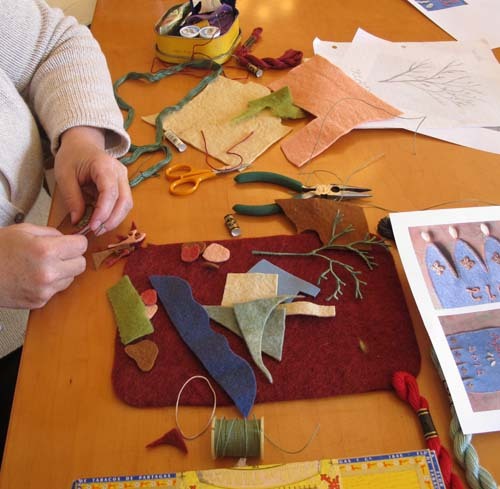 The first challenge was selecting felt and thread colors. Then, I showed them how to form and wrap the wire letters. This is a technique I’ve been developing for some time, but I’ve never explained or demonstrated how to do it. The wrapping technique can be quite tedious and fussy, but this group picked it up quickly. They didn’t seem frustrated and became engrossed in the process, asking questions along the way. Lynn wanted to make a wire plant instead of words, so I showed her how to form and wrap branches. Christy started a cheerful purple Christmas banner, which will include felt holly and other embellishments. The hours passed quickly and by closing time at 4:30, everyone’s project was progressing well, but nothing was completed. I know that Christy is working on hers at home, because she wrote to ask some questions yesterday. Will I teach any more classes? I’m striving for the right balance between time out in the world and time creating in my studio. With so many projects planned, I hesitate to commit to teaching workshops, especially if it involves travel. I find it difficult to do my artwork if I’m constantly coming and going, preparing and recovering. Teaching at a venue close to home makes the idea sound more manageable, but I still guard my studio time like a mother bear! This entry was posted in Embroidery, Events, my design productions by Salley Mavor. Bookmark the permalink. Oh I really wanted to take this but the timing was all wrong. I’m still counting my blessing for getting to see you work up close and personal in New York so I’ll stop my whining. But I sure wish i could have been there! How many does it take to teach a class at your studio? I have a group of ladies who might be interested. I’m considering offering classes for 8 in my studio, but haven’t figured out the details yet. Sounds like it was great. Would you ever consider doing an on-line class? That would be a smart thing to do, but time consuming to set up. Just the thought of organizing an online class is overwhelming. Another option might be going to one of the festivals where you could do more of an ongoing demo than a class. Or make some videos so people can buy them. But then again, sometimes creativity forces you into the studio to work… and your work is so lovely I wouldn’t want to stop you! I so understand the need to find balance and to guard the time you devote to your art. I wish I lived nearby, though, because I would love to learn that wire wrapping technique! Ohhh, the lucky women that made it to the workshop. I too understand your guarding your workshop time like a mother bear. I find it frustrating when I even have to take time to go to the eye dr, or dentist – necessities. Well, I’ll keep practicing from here and join one of your classes when I can. I think my comment got lost… let me try again! An online class would have the benefit of videos that you could reuse, thereby reducing cutting studio time 😉 Or you could just go ahead and make videos of your techniques. I am sure many of us would buy them! Or you could go to one of the yearly festivals to share in an ongoing demo style. Or finally, maybe get someone to photograph your techniques to share another way. Often creativity forces you into the studio to create while the idea is still in your mind. And I can understand that- and your work is such a lovely result, I would not take that from you! Thank you for such good suggestions. I knew that this post would open Pandora’s box. It’s nice to know that there is interest in learning my techniques, but as you can tell by my comments, I’m ambivalent about the whole teaching thing. It seems that I’m always juggling too many balls at once. Giving a few classes in my studio is all I can handle right now. I would love to attend a class on making the wee folks! Please post one if you ever do one on the cape! Need help!! I live on the Cape and would love to learn a better wire wrapping technique. Mine is so bad. 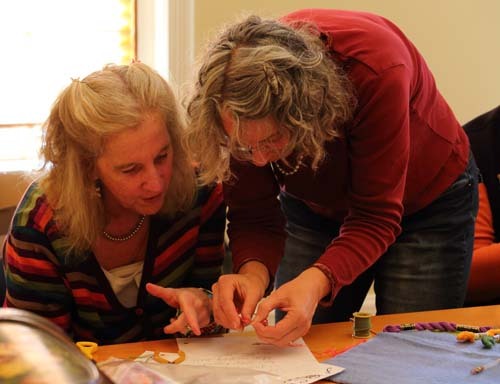 Would love to attend any workshops you set up on the Cape – especially for the wee folks! Oh yes Sally, teaching is very tiring.I did it for 30 years, and now resist it like mad!It’s very rewarding, but I found I couldn’t create, and teach. Now that I’m Retired, I guard my play time very closely!Lucky ladies to have had your workshop though.Making instructional dvd’s is what I’d be doing if I were you.Have you thought of doing that? .I just bought a Patti Culea doll making dvd and it is sooo good to be able to replay it whenever I like. I would LOVE a dvd of your processes.Not many people can afford the luxury of classes, and you( the dvd maker) only have to do one “class” so to speak. It’s so good to hear the voice of experience! A couple of years ago, I decided to let my art lead the way and that approach has helped me choose what to do and what to put aside. Thanks for the reminder. Thanks for all your lovely posts, always a pleasure ! Querida Salley como gostaria de ter essa oportunidade de fazer uma oficina com vc, seria pouco tempo eu sei, mas maravilhosos aprendizado!!! sou sua admiradora, por ter conseguido um lindo caminho para os feltros e linhas !!! I wish i lived closer!! love seeing what you have done. What a wonderful program you have taught with the banner making! Would loved to have been involved in your project, but seeing it on your blog is almost as good as being there. Would love to see more posts on this event Salley. 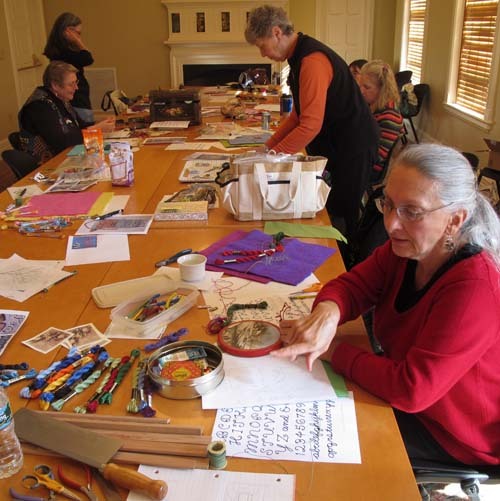 It looked like everyone had a GREAT TIME being creative and sharing their talents. Wish I could have been there.. I discover your textile work, and I am in profound admiration, it is so beautiful! Thank you for the inspiration, I would often come! Those are some very lucky ladies! I can’t imagine a more enjoyable way to pass the day. Can you share what type of wire you use to create your words? I read somewhere on your blog that you use a fabric-coated wire. I imagine that is to make the floss stay put as you wrap. I’ve had a hard time finding it locally. Thanks! I use 32 gauge floral spool wire, which is covered with green paper. It can be found in the floral section of craft stores like Michael’s. Que bom,bem que eu gostaria de estar aí.Abraços!